Cassie Taylor grew up in public to a rare degree. Not long after she began playing the electric bass at age 12, she undertook a ten-year-long tour of duty, performing with her father, Otis Taylor. She released her first solo recording, Blue, in 2011. Now 26, she has written and recorded a new long-player–the first, she says, to really express her own vision. Out Of My Mind is by no means strictly a blues album. Its 13 songs draw on a rich array of styles, filtered through Taylor’s keen musical sensibility. The program opens with the two-part “Ol’ Mama Dean,” both of them rockers driven by Steve Mignano’s heavy guitar work and shot through with organ. Taylor, her voice sometimes treated with effects, tells the story of a woman condemned to death for killing her abusive husband. Taylor (bass) and Larry Thompson (drums) unfurl “Spare Some Love” at a funereal tempo. Mignano’s single-coil tone is colored with just the right amount of hair, and, despite its dramatic moves, his solo never takes on any hint of posturing as it builds to a stormy crescendo, then ebbs back into the song’s haunting, bare-bones frame. “No Ring Blues” boasts an indelible melody, its offbeat phrasing accentuated by a quirky, almost robotic, stop-and-start rhythm defined by Taylor’s distorted bass guitar. “Gone And Dead,” with a similar approach to the groove, is at once unsettling and appealing: Taylor’s vocal is cool, almost seductive, though her subject matter is grim; and the guitar and organ tones are altered to an almost queasy degree. It is a study in curious contrasts. An insistent pulse and overdubbed, processed guitars lend “No No” a glinting, New Wave-sleek air. Notwithstanding some rhythmic playfulness during the solo section, the catchy “That’s My Man” is far more straightforward, a streamlined rocker with a solid blues foundation. Taylor works as interestingly, and successfully, in other genres. The title track, fattened by Steven Vidaic’s Hammond organ, is a mid-tempo soul inferno, laden with irresistible vocal and instrumental hooks. “Forgiveness” layers horns over a driving, relentlessly upbeat, folky rhythm. The minor key verses of “New Orleans” creep along like an alley cat, muted trumpet adding bordello flair, while its upbeat choruses are awash in buoyant horns. Mignano’s guitar break is slinky and dirty. Taylor invests the beautiful pop-y melody of “Lay Your Head On My Pillow” with a warm intimacy, her images outlining long-term love over a striking acoustic guitar figure. The disc closes with “Again,” a fine R&B ballad with a stop-time section, a wonderfully tender and tough guitar break, and elements of Ray Charles and Randy Newman echoed in the arrangement, which hinges on Taylor’s piano. One of my favorite things about Cassie Taylor is that she–almost uniquely, it seems, among blues-based female vocalists–has no interest in being the next Koko Taylor. Instead, she sings with a beautifully pure tone that is no less powerful, or less emotionally resonant, for its clarity. Beyond that, her writing is both intelligent and moving, with exceptionally strong melodies and challenging rhythms, and her production is vivid and adventuresome. 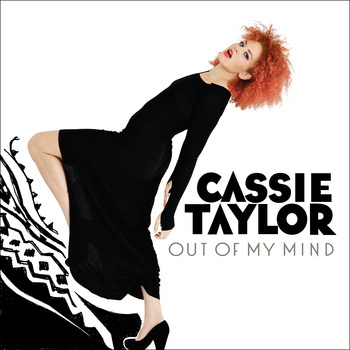 Taylor is an artist to watch, and her Out Of My Mind is a splendid album that explores pop, rock, and soul from many angles, yet remains deeply informed by the blues. Review copy provided by Yellow Dog Records.